Yea Sara! I found you right off the bat. (I'm in your SLIS class.) Congrats on a great blog site. How oh how did you get it out to so many followers? hey, sara. :-) I was in your SLIS 5100 group last semester. I read your article in Voya and thought it was great. :-) Your blog is fantastic. Hi! I'm a book junkie, and I just discovered your blog about a week ago! I'm 15 and I noticed you read a lot of my favorite books. (Shiver, Anne of Green Gables, Hunger Games and Catching Fire, Hush Hush... etc) And I just want to recommend a really great book/series that I would love to hear what your review of it would be. It's called the Mortal Instrument Series and the first book is City of Bones. I know you've said you don't really like fantasies... but I didn't for a while either until I found these books. They're full of a whole lot of romance and humor! Not to mention some girl power from the main character Clary. And if you liked Patch from Hush, Hush you'll fall in love with Jace. His jokes are hilarious and highly quotable, and he is perfectly crush worthy. Anyways, I'd really love for you to review these books. :) Please and thank you! Hi there! I came across this blog because Greenbean TeenQueen was my nickname as a teenager. My email for the longest time was greenbean1313. I have worked at a bookstore and a library. I also love YA fiction, so it works for that too! Hi there! 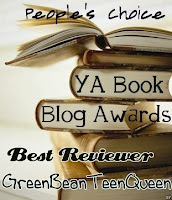 I came across this blog because my nickname as a teen was Greenbean TeenQueen. My email for the longest time was greenbean1313. One of my friends even wrote me a poem with that title. I worked at a library and a bookstore. I also love reading YA fiction, so that works too! Found your site via Literary Rambles! So glad I did! I look forward to reading it!